At just 4.5” inches, it’s hard to believe the kidneys cleanse upwards of 150 quarts of fluid from your body every day. It can be easy to overlook the importance of kidneys until their wellbeing is in jeopardy, but they are essential to healthy bodily functions. 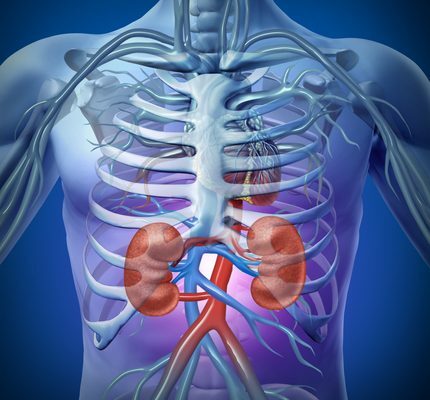 Read on to learn more about the kidney’s role in the endocrine and urinary system and the ways in which they purify your blood. The kidneys play a vital role in the human body. These fist-sized organs, located on either side of the abdomen, provide the human body with a unique filtration process to purify blood and remove waste. Proper kidney functionality is imperative to good health, mobility and longevity. The kidneys receive a supply of blood from the renal artery, remove impurities from the blood, and then return the blood to the body through the renal vein. The kidneys remove toxins and unnecessary waste by means of urine, which travels from the kidneys to the bladder. Kidneys are comprised of different parts and tissues. One critically important part is called a nephron. There are more than one million nephrons in each kidney that all work together to remove waste and impurities from the body. Each nephron filters a small amount of blood, which is why there are so many of them within the kidneys. Kidneys are under five inches, making them smaller than a computer mouse or a cell phone. At OCRC, we are working to help create a better future for those impacted by chronic kidney disease. We are currently in need of volunteers for our Kidney disease study. Currently seeing a nephrologist and taking medicine such as Procrit® or Epogen® for low blood count, Aranesp® for anemia, or PhosLo® or Renagel® for high blood phosphorus. If you are interested in participating, please tell us a little more about yourself in the Contact section of the home page and we will respond to you to determine your eligibility for current and future studies.